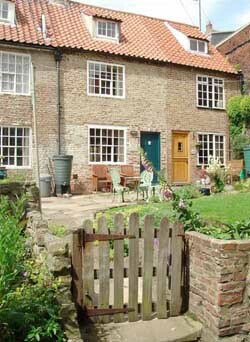 Pottery Cottage is a delightful holiday cottage offering superb accommodation in the heart of old Whitby. The cottage offers the perfect base for visitors looking forward to exploring and enjoying the historic town of Whitby, the North Yorkshire Coast and North Yorks National Park. Only seconds from the bustle of Church Street, this 17th Century fisherman's cottage is situated in Blackburn's Yard. 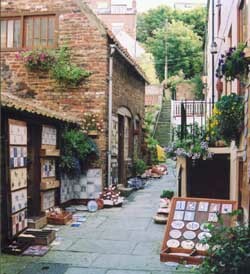 Sheltered and picturesque, this is arguably the nicest of the famous old Whitby yards. A feature of Blackburns Yard is its award winning community garden - once the location of many more cottages which fell into disrepair and eventually collapsed. 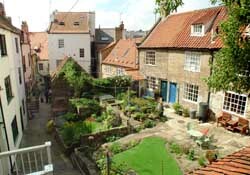 The terrace, where Pottery Cottage is located, had a demolition order on it in the 1970's, but a change of council caused a reappraisal of their unique importance to the Whitby's history and they were designated as Grade II listed buildngs and saved. A major renovation of Pottery Cottage was completed in May 2008, maintaining historic features such as its panelled walls and beams, whilst equipping the cottage with contemporary fittings and comfortable furnishings. The Victorian author, Mary Linskill, was born in Blackburn's Yard in 1840. Her book "The Haven Under the Hill" was based on the old Whitby streets and yards which nestle under the East Cliff, overlooked by St Mary's Church and Whitby Abbey. Today, Pottery Cottage and Blackburn's Yard can be considered a modern 'Haven', as it provides a tranquil retreat fo your holiday only steps away from one of the most impressive tourist destinations in Britain. 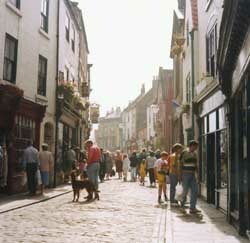 Step out of Blackburn's Yard and you find yourself in Church Street, the busy cobbled street which has been at the centre of Whitby life since the middle ages. Here, it is easy to imagine life in Whitby in Captain Cook's day, when Whitby was one of the busiest ports in England. A short walk will bring you to the Old Market Place, the Harbour side, Tate Hill Beach, the East Pier and the famous 199 seps, which lead you up to St Mary's Church, the Abbey and some superb views of the town and the sea. 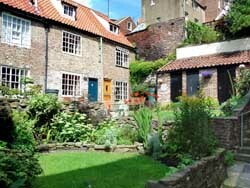 Our aim is to make your holiday in Whitby an enjoyable, comfortable and memorable experience. Pottery Cottage will provide you with holiday accommodation of the highest standard combined with the pleasant historic character of a cottage which has provided a sheltered home to families for some 250 years.